It's that time of year again, when we start thinking towards the colder months and increase our woolly Hat production! And that also means that we start our monthly knit-a-longs over in the Ravelry group. This Hat has proven to be the most popular from Classic Woolly Toppers and it's the ideal Hat to kick start the KALs. Incorporating a whole bunch of techniques, it's a fun Hat to knit. 4 sizes are included, making it ideal for the whole family or seasonal gift giving. Furthermore, it's a Hat that looks just as good in a variegated yarn as it does in a solid. The style of Hat - with it's roomy beret like body and that peaked brim - makes it a Hat that suits a whole lot of people. It's very wearable, and looks just as good on short hair as it does long, and on all face shapes. You'll find lots of little attentions to detail... one being how the columns of twisted stitches line up in relation to the brim. 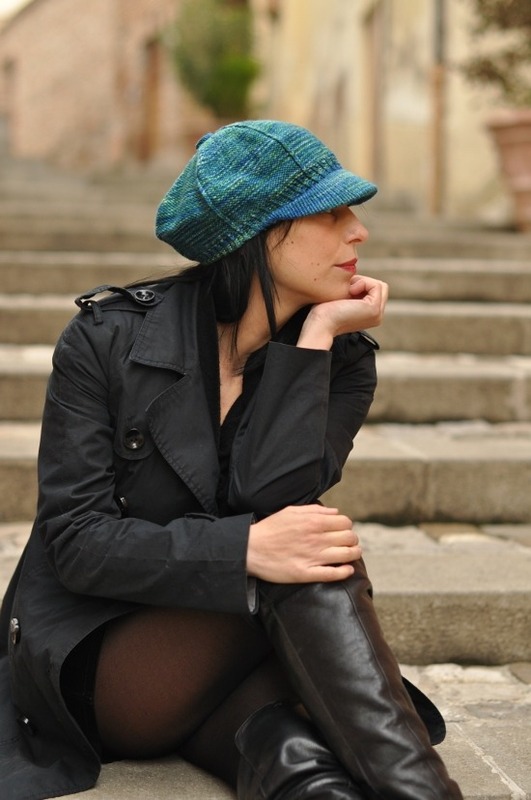 If you've closely looked at a stitch version of this type of Hat, you'll notice that the seams don't fall at the centre front, and instead the half way point between the seams is at the centre front. When working through this design, this detail was an important one to maintain; the design would have been much easier without that. Camden Cap differs from other knitted caps of this style in other ways, too. Here, we knit the brim *first*; it isn't an add-on or after thought, and there's no picking up of stitches to be done. The brim is shaped using short rows, a technique that I love for so many reasons, and they prove really effective here. For stiffening the brim you could use craft plastic, yet I recycled a plastic bottle, and tips on how to do that are included. Rarely do I get to knit and wear one of my own designs, yet I'm determined with this one. I've even ordered some fibre from HillTop Katie so I can spin my own yarn and make myself a pretty special Hat. I'm really looking forward to doing something for me, and having a Hat I can wear for fun - you wouldn't believe how rarely this Hat designer gets to do that! So if you fancy knitting along with us, please do come and join us!